As Lucha Underground's third season rolls on, the 5th October edition featured Prince Puma (Ricochet) receiving a shot at "The Monster" Matanza Cueto's (Jeff Cobb) Lucha Underground Championship, thanks to Dario Cueto's Dial of Doom. The Mariposa (Cheerleader Melissa), Ivellise, [Brian] Cage and [El] Texano [Jr.] were also in action, so this was going to be great, right? The main event where Prince Puma unsuccessfully challenged Matanza Cueto for the Lucha Underground Championship was a cracking effort, settling into a fun power v speed dynamic. The pacing of this was really nice, as Puma and Cueto showed a load of chemistry and looking much more familiar with each other than their records show. The match built well from when Matanza took control on the outside with Puma having to fight from under neath, a style which suits the former Lucha Underground Champion well. One of my favourite moments in the bout was a Northern Lights suplex, followed by a brainbuster from Puma, because it came just at the right time and the crowd went nuts for the impressive move. The finish was superbly put together as just went it seemed like the momentum had finally swung all the way to Puma's favour as he'd the 630 splash that won him the title initially, only for Mil Muertes (El Mesias) to intercept him. Dario Cueto made sure the ref wouldn't call for the DQ and his brother his hit Wrath of the Gods to retain his belt. The Dial of Doom gimmick created an entertaining main event, that in hand elevated the feud between Puma and Muertes, as well as increasing the prestige of Cueto's reign. The opening match saw Ivelisse defeat The Mariposa in a match that didn't do a whole lot for me as a viewer. The action was all too often wooden, with Mariposa especially looking a little out of sorts inside the ring, struggling to simple bumps. This match was mostly Mariposa's second Marty "The Moth" Martinez getting involved in various ways, including at one point trying to kiss Ivelisse. The interference didn't seem to go anywhere though and while Ivelisse was able to overcome it, it felt like it needed something a bit more convincing to complete the story that had been told throughout the bout. It was the Desert Eagle (Sunset Flip Powerbomb) that got the win for the babyface, seemingly coming out of nowhere. Both of these women are extremely talented, so perhaps it was their unfamiliarity without each other, alongside the need for the constant interference, that lead to this not quite delivering. Cage went two nil in his Best of Five Series with Texano, after a good back and forth encounter. This was a strong heavyweight tussle, that remained fairly even until Cage got the pinfall, as they traded power moves for near falls. A section that saw both men miss big moves, before Cage hit a tornado DDT was a particular highlight for me, as it got over the familiarity of the pair that only really comes during a series of this nature. There was some nice near falls peppered here and there, as well as a good sequence into a sitout Alabama slam, before Cage picked up the win with a deadlift superplex and a Fireman's Carry Facebuster. Almost inevitably with the Best of Five Series it felt like both men were holding more than a little back for future encounters, but that didn't stop this from being a solidly entertaining clash from start to finish. 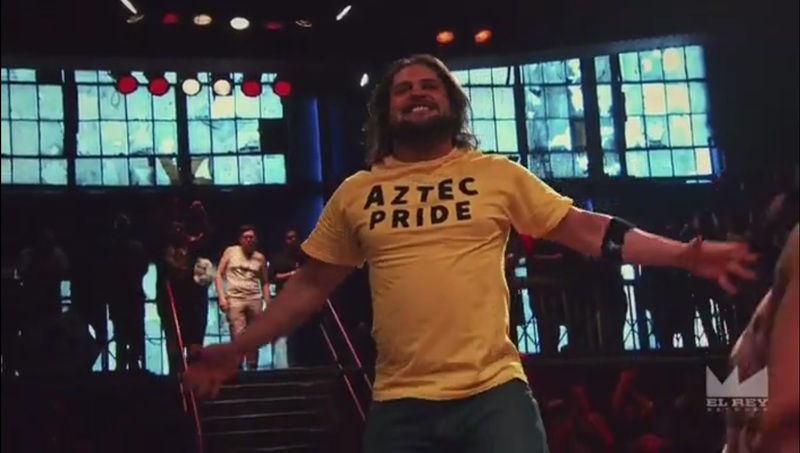 A solid episode of Lucha Underground this week, as Prince Puma and Matanza Cueto had a very good main event contest and Texano & Cage put on a admirable display in their best of five series. It was shame that the third match on the card couldn't keep up with the other two as Ivelisse and The Mariposa's clash didn't do a whole lot for me. There was a lot of building blocks laid down on this episode, as Puma's feud with Mil Muertes was enhanced and hopefully over the next few weeks we'll see the decent work done by Texano and Cage improved upon as their series continues.